The development and utilisation of engineering geological models is at the forefront of GRS’s approach to ground problems. GRS have extensive experience in the use of engineering geology and engineering geomorphology to develop conceptual, observational and analytical engineering geological models for a wide range of civil engineering applications in a variety of geological and geographical settings. Models developed to characterise, quantify and analyse ground conditions for civil engineering applications allow for the documentation of uncertainty (e.g. uncertainity and risk registers) and enable focused site investigations at key stages of a given project. This ensures that potential ground risks are identified and assessed, minimising the occurrence of “unforeseen” ground conditions. In a general sense, the risk to an engineering project from ground-related hazards is proportional to the level of detail and accuracy of the engineering geological model. The better the model reflects actual conditions, the lower the remaining risk. However, it is not possible to define every finite detail of the ground and so, ultimately, the objective of an engineering geological model should be to provide sufficent detail and understanding of the ground such that potential risks to the project from ground-related hazards are identified as far as possible, and are investigated and evaluated thereby reducing risk to acceptable levels. For exactly the same geological setting, different engineering projects will require different questions to be asked, different models to be developed and different investigations to be carried out because of the varying interaction of specific engineering works and the ground. Furthermore, depending on the project, certain engineering geological parameters may be more critical than others and some projects, by their very nature or setting, are exposed to more geological risk. The conceptual engineering geological model is generally produced on the basis of existing data, such as geological maps and memoirs, topographical maps, aerial photographs and published information. However, a comprehensive desk study in itself does not form a model. It requires knowledge, precedence and experience to evaluate the data and formulate the model. Re-examination of previous ground investigation by GRS during a tender proposal revealed (a) cohesive fine grained colluvium (typically a silty clay), probably originating from slope wash or numerous small landslide deposits over considerable time; and (b) clastic colluvium comprising cobbles and boulders, possibly representing debris from a large magnitude, high energy, relatively rapid landslide event(s). 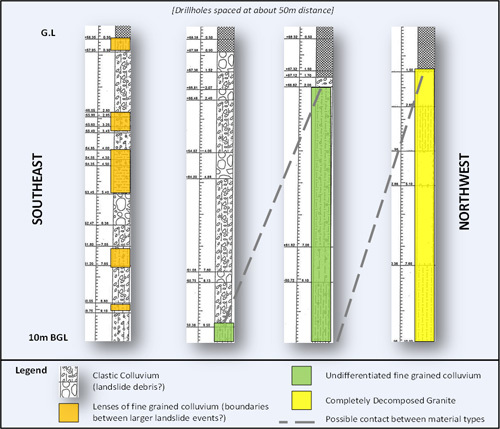 The clastic colluvium was >9.5m thick and in parts was interbedded with fine material suggesting that there may have been more than one episode of failure. GRS's re-interpretation of original data provided the bidding contractor additional critical information indicating that the site in question was potentially considerably more problematic than the geotechnical information provided implied. Parry, S., Hart, J.R. & Moore, A.J. (2009). Reducing Uncertainty in Natural Terrain Hazard Studies: the Role of the Engineering Geologist. Proceedings of the 29th Annual Seminar, Geotechnical Division, Hong Kong Institution of Engineers. pp 61-70. Where no information is available GRS are able to develop models from aerial photograph interpretation and/or field reconnaissance enabling a rapid evaluation of the potential risks at a site. Parry, S. & Ng, K.C. (2010). The Assessment of Landslide Risk from Natural Slopes in Hong Kong: An Engineering Geological Perspective. Quarterly Journal of Engineering Geology & Hydrogeology. Evolutionary models are a conceptual model that illustrates the geological evolution of a site or particular geological conditions or processes which are relevant to the project. Evolutionary models are very useful for the communication of engineering geological concepts to non-specialists. An example of an evolutionary model prepared by GRS for a project in Qatar is shown below on the left and a larger version can be viewed here. Observational engineering geological models are usually developed on the basis of a project-specific site investigation and build on the conceptual model. As such the unknowns associated with the model at this stage should be well defined and limited. Typically, the observational model provides information that is used at the preliminary design stage. 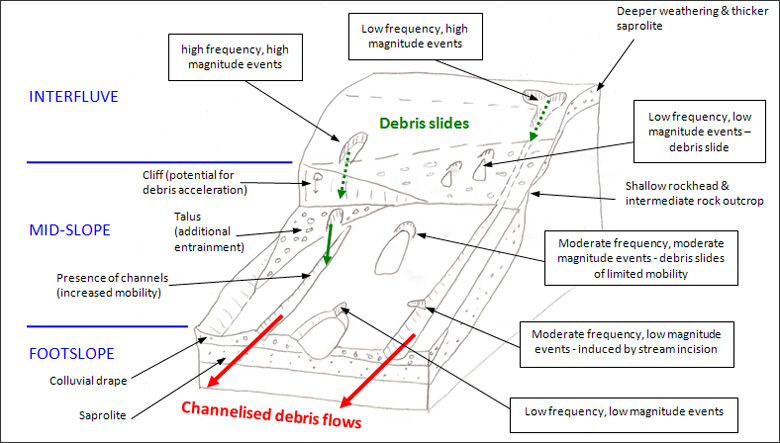 Examples of observational models prepared for a natural terrain hazard study recently carried out by GRS are shown below on the right and a larger version can be viewed here.